After a fabulous trip to British Columbia and Alberta, I am refreshed and ready to continue my travel blogs, retracing my steps in time to May 2013, when I toured the Burgundy wine region of France, drove to Monaco to watch Monte Carlo set up for the Grand Prix, flew to Lisbon for a visit, and ended my vacation in Spain. And yes, in a future thriller Darcy and Bullet will follow in my exact footsteps as they race against time to track down a killer before he strikes again. So focused are they on nabbing the murderer that they have no inkling someone else is fervently stalking them—until the hunter has them in his gun sight. Can Darcy stop him before he delivers a lethal blow? 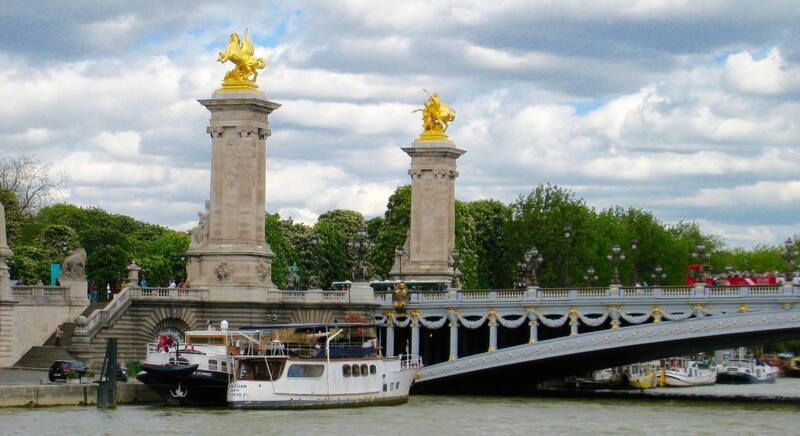 In late 2012, my gypsy husband decided it was high time I saw Paris. No, I had never been. Without missing a beat, he began planning our next trip. In May 2013, we boarded a flight from DFW to London and from there to Paris. Just before noon, we checked into the Hôtel Duminy-Vendôme in Paris. 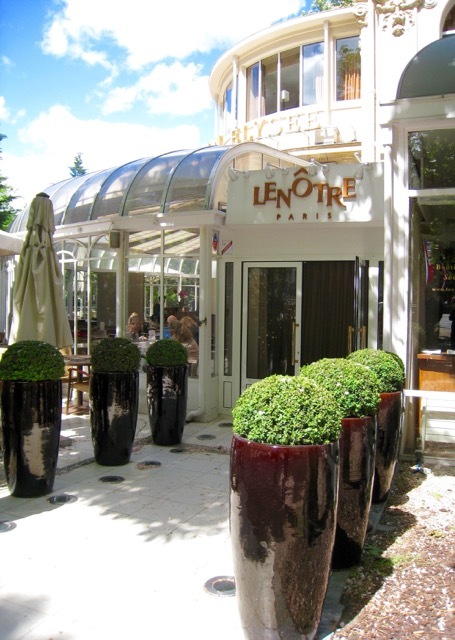 Famished, we dumped our bags in the room and immediately left for a brisk walk down the Champs-Élysées to Le Café Lenôtre. In my head, I played and replayed Joni Mitchell’s “Free Man in Paris,” as I finally had my chance to stroll the popular boulevard. When we reached the Arc de Triomphe, we retraced our steps to the restaurant. Seated in a quiet corner on the outdoor patio, we played tourist by poring over a map to chart an agenda for the next few days. We glanced at the menus, ordered, and dismissed the puzzled look on our server’s face; by no means is our French good, but we manage. Our orders arrived and our server left. We looked at each other and burst into laughter. Absorbed in our plans for the days ahead, we had overlooked the fact that an “entrée” in French is a dish served before the main course, i.e., a starter. With the attitude that there is a reason for everything, we ordered two more starters, giving us the opportunity to sample a broader selection of dishes and still leave room for dessert. After lunch, we headed to the Seine for a boat cruise down the river. 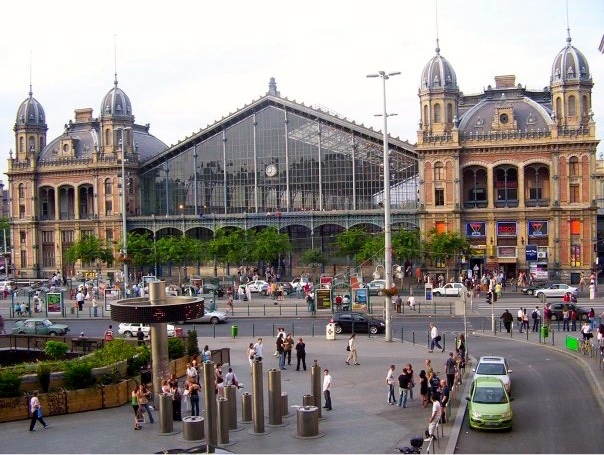 We queued up at Bateaux Mouches, boarded, and settled into our seats on the upper deck for a view of the iconic sites of Paris—Notre Dame, the Eiffel Tower, the Louvre, and the Musée d’Orsay, to name a few. There are some things you should experience once, and the river tour was one of them. From what I’ve heard, the summer tourist crowds can be quite unruly, but fortunately we were subjected to only one discourteous group of six, clad in tank tops and shorts, who soon sought refuge below deck, complaining about the chilly, overcast day. More interested in photographing the Eiffel Tower, I hadn’t paid much attention to the weather other than to consider how it might affect my pictures. After photographing the Eiffel Tower from a distance, I couldn’t wait for an up-close look at this magnificent structure, so the minute we disembarked from the boat we headed straight there. 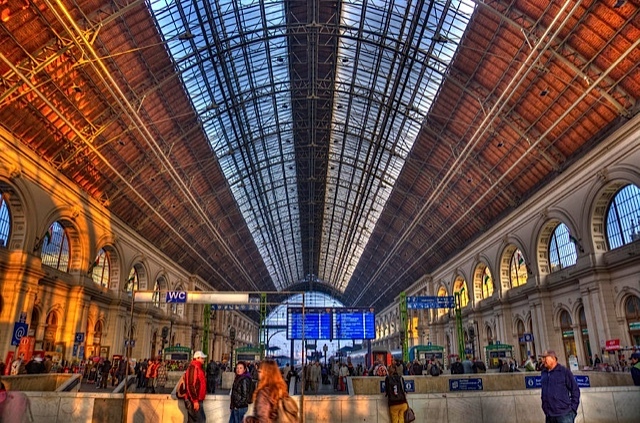 Ever since I had admired the architecture of the Budapest-Nyugati Railway Terminal, also built by the Eiffel Company, I had wanted see the tower. When we arrived at the famous landmark, I was awestruck by the massiveness of the iron structure. 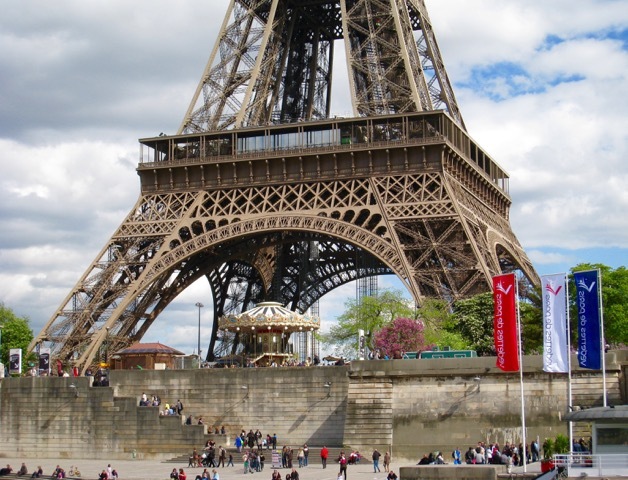 It was impressive in size and construction, and I was looking forward to dinner at the Jules Verne restaurant—for the food, but more so for what I anticipated would be a breathtaking view of Paris. However, I would have to wait. That night, we had reservations at Kunitoraya and planned to retire early, as jet lag had begun to set in. 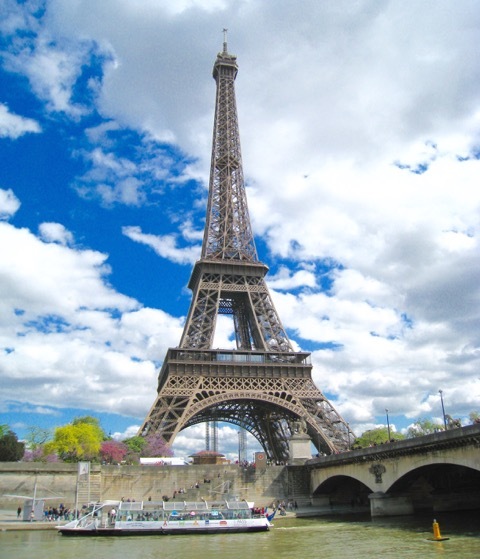 This entry was posted in Travel and tagged Eiffel, Eiffel Tower, Europe, France, Paris, travel on June 11, 2015 by Pat Krapf. Monday dawned gray and rainy on our last day in Prague. Thankfully, our only plans were to board a train for Vienna. At the main station, we used the last of our crowns, the official Czech currency, to buy chocolates before we boarded our train for the four-hour and forty-five-minute trip. We passed the time looking at our vacation photos on our iPads, listening to music, reading, and taking a short nap. We arrived in Vienna to rain. By the time we made it to the cab stand, a two-block walk from the train station, we both had only two things on our minds: hot showers and dry clothes. We had reservations at the Radisson Blu Style Hotel. I was surprised to see that this Radisson was not reminiscent of some of the ones I had stayed at in the US. 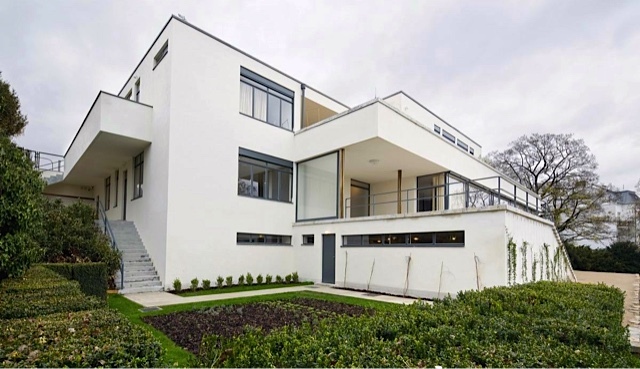 The Vienna hotel was contemporary in design and our modern room spacious and well appointed. 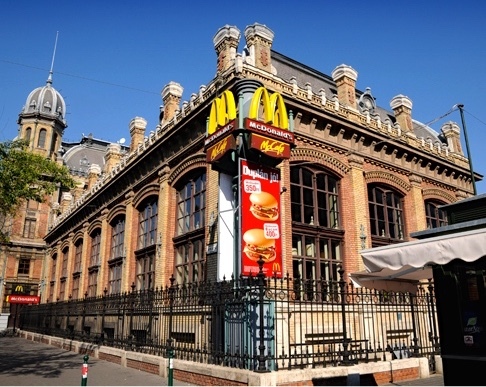 It was also located in the heart of the cultural district, close to every attraction, and near the famous Café Central. The Viennese love their afternoon coffee and a pastry, and the city boasts many popular and different coffee houses to choose from. And they are all united by their strict adherence to the basic rule of Viennese café culture: those who wish to quietly read the national or international press, available to all customers, will not be disturbed by a server even after hours of perusing the newspapers. Those in a hurry can stand up to enjoy their gastronomic delights. After we unpacked and changed, we went for a long walk with no particular destination in mind; we wanted only to get some exercise after sitting for almost five hours on a train. About we’d walked three city blocks from our hotel, the late afternoon sky grew darker and the drizzle became a light rain, so we quickly retraced our steps and arrived at the Radisson just as the light rain turned into a downpour. We had a glass of wine and shared an appetizer in the lobby of our hotel while waiting for the weather to pass, but the rain showed no signs of easing. So we checked to see if we could reserve a table at Sapori, the award-winning restaurant inside our hotel. Since they were able to accommodate us, even on such short notice, we dined in for our first night in Vienna. The next day the inclement weather had improved enough to sightsee without getting drenched. By now, our trip was winding down and we were as well. 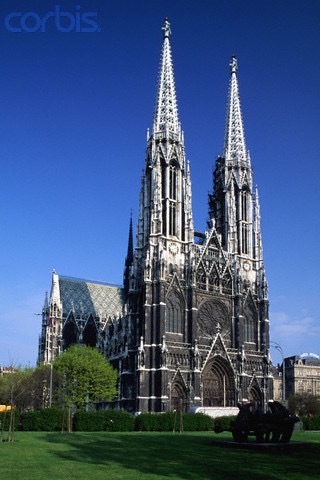 Since we had visited Vienna once before and for a longer duration, we planned to pace ourselves during our sightseeing. Or so we both said. Our goal for the day was simple—to walk. And to visit several parks along the way. We began our day’s self-guided walking tour with the Ring, or Ringstraße, a circular road surrounding the Innere Stadt district. 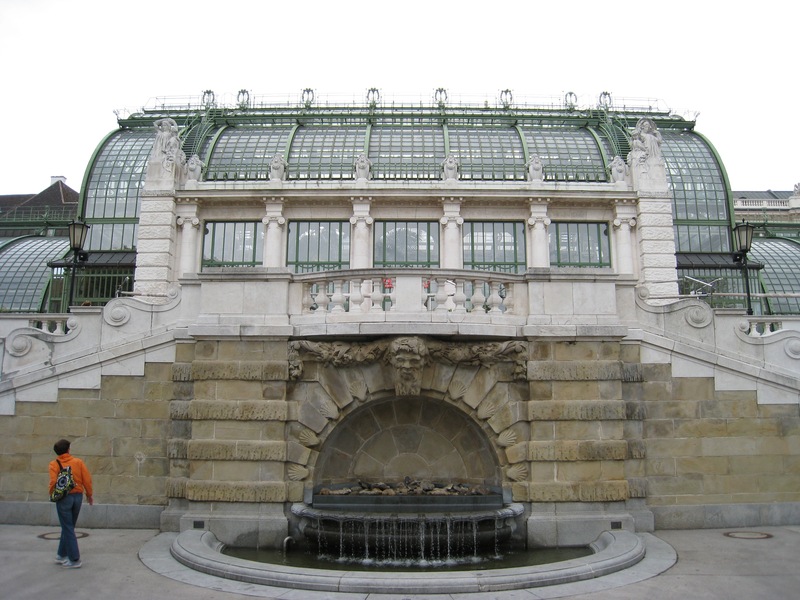 Its architecture is typical of the eclectic, historicist style called Ringstraßenstil of the 1860s to 1890s. Our first destination was the Votive Church. The church was built to thank God for saving Emperor Franz Joseph from a failed assassination attempt; it was a votive offering. What intrigued me was seeing photos of the massive pipe organ and the beautiful rose window behind it. But the church was closed for cleaning and renovations. Despite the scaffolding and canvas tarps that covered a good portion of one side of the church’s exterior, we were able to photograph it. In certain sections, the walls looked almost black in color, until I saw the cleaned areas. The church is built of white sandstone, and with its elegant and distinctive twin spires that appear almost lace-like, it is an impressive neo-Gothic work of art. 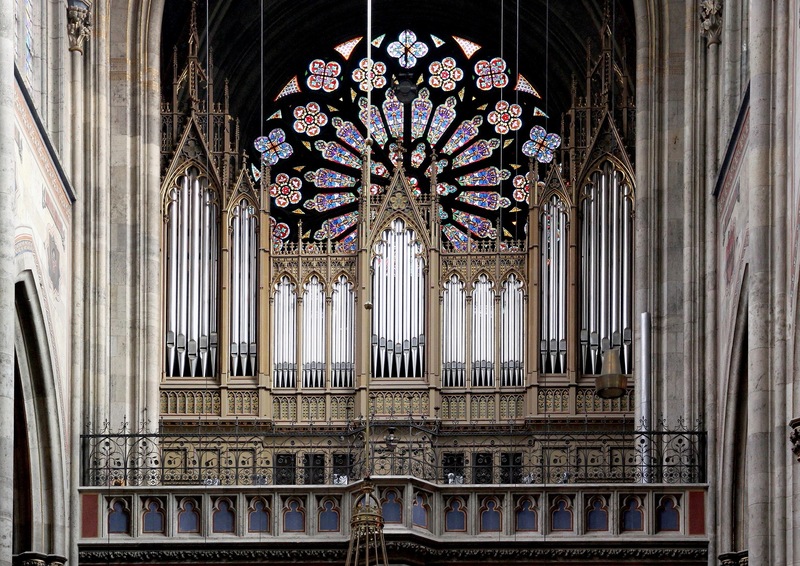 (The photo of the pipe organ and rose window is courtesy of Bwag/Commons). From the Votive Church, we crossed to Sigmund Freud Park. 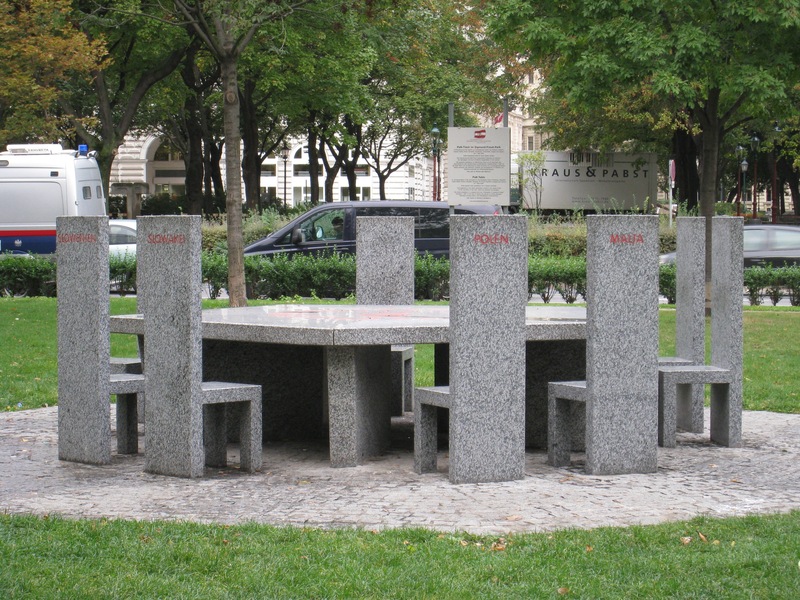 In May 2004 a granite table surrounded by ten seats was erected in the park to represent the European Union’s ten new member states. Retracing our steps, we paused often to snap photos of the town hall, Parliament, and various other government buildings and museums as we headed to the Monument to the Empress Maria Theresa. Maria Theresa was the only Queen regnant of the Habsburg dominions and the last of the House of Habsburg. She governed from 1740 to 1780. During her reign, she not only ran the country, but also reformed the school system—and raised her sixteen children. We photographed the Hofburg Palace, the former imperial palace in the center of Vienna, then wandered toward Burggarten, the private palace garden laid out in an informal English style. With the fall of the Habsburg Empire, the park opened to the public. As the noon hour approached and we drew near Palm House, we stopped for a coffee break. Palm House was built between 1901 and 1907 and was designed by Friedrich Ohmann in the art nouveau style. One section of the iron and glass greenhouse is home to Butterfly House, where you can see hundreds of tropical butterflies and even bats. The other side houses a popular café. After all the walking we had done, we treated ourselves to an espresso and a slice of Sacher torte. 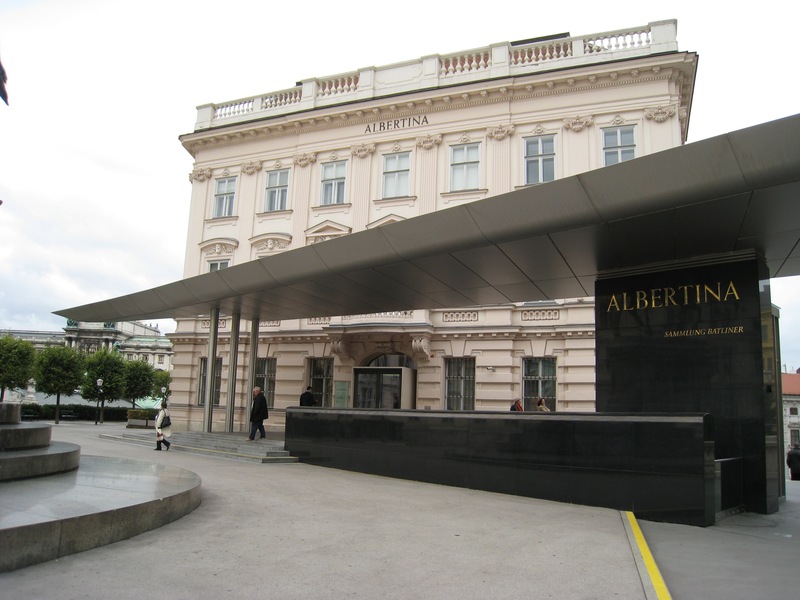 Charged from our caffeine intake, we set our sights on the Albertina Museum. 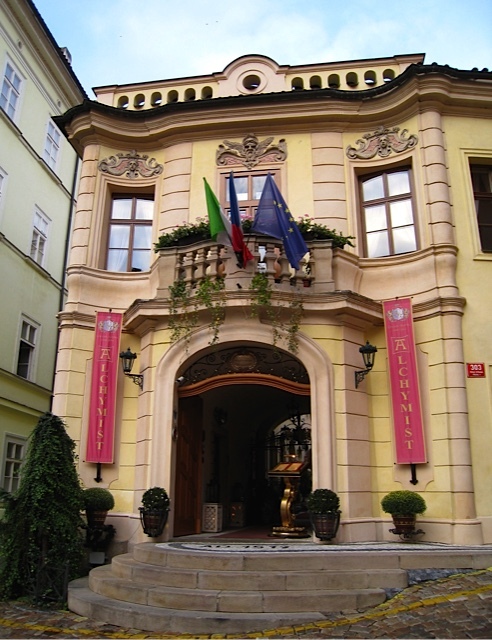 The building sits on an elevated post atop the Augustinian bastion near the Albertina Palace and the Hofburg. The museum has three main collections: architecture, photography, and graphic art. Today, the collection consists of around fifty thousand drawings and one million prints. What I wanted to photograph was the museum’s modern exterior. Next week, one of the main highlights of our trip, and we witness an unexpected delight as we stroll past the Spanish Riding School. This entry was posted in Travel and tagged cafe, cafes, Europe, travel, Vienna, Votive Church, Wien on April 23, 2015 by Pat Krapf.